Since ancient times, nuts and seeds have been an important source of nutrients for humans. Vegans tend to eat more nuts and seeds than non-vegetarians. Actually, cultures worldwide have used nuts as staples in plant-based cuisines for centuries. This is not a recent phenomenon. Nuts are the source of energy and building blocks for the new plant. No wonder that they are nutrient-dense foods. They have everything that a new life may need: essential amino acids, unsaturated and monounsaturated fats including linoleic acid and linolenic acid, vitamin E, vitamin B2, folate, fiber, and the essential minerals magnesium, phosphorus, potassium, copper, and selenium. Nuts are most healthy in their raw unroasted form, because roasting can damage and destroy fats during the process. Unroasted walnuts have twice as many antioxidants as other nuts or seeds. Nuts have a very low glycemic index (GI) due to their high unsaturated fat and protein content and relatively low carbohydrate content. Consequently, dieticians frequently recommend nuts for people with insulin resistance such as Type 2 diabetes mellitus. What vegans have to know about nuts and seeds? Almonds have good amount of proteins. However, the proteins are low in essential amino acids lysine, methionine and cysteine. The richest in calories (656 calories in 100g). The richest in total fat (66g of total fat in 100g, which is 101% Daily Value). 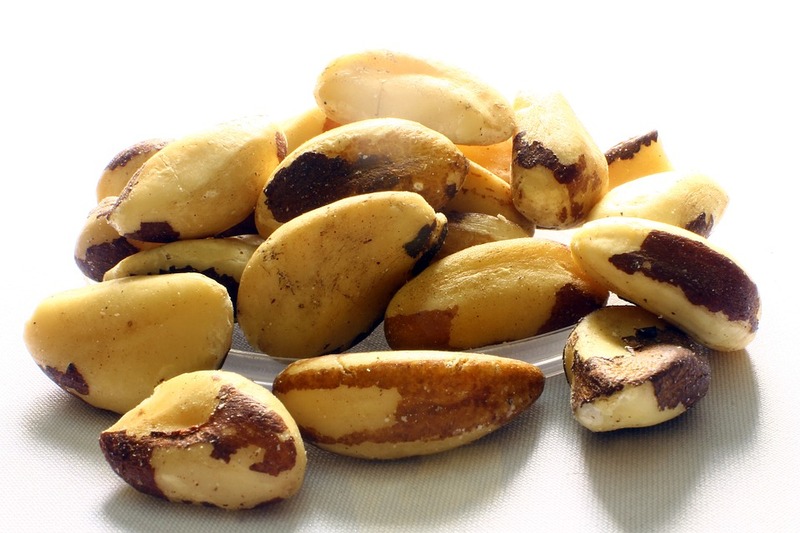 The richest dietary sources of selenium, with a one-ounce (28g) serving of 6 nuts supplying 774% DV. These nutrient-dense nuts are extremely valuable as a healthy food that can successfully improve thyroid health. Every vegan must include hazelnuts in their daily menu. Hazelnuts or filberts have 7 (!) essential vitamins at significant amounts: vitamins B1, B5, B6, B9, C, E, and K. If you eat hazelnuts on a regular basis you can enjoy all the health benefits that these vitamins provide. Hazelnuts contain high amounts of manganese, copper, phosphorus, and zinc for your overall health. Hazelnuts are rich in flavonoids that support brain health, improve circulation and reduce symptoms associated with allergies. Vegans are recommended to eat peanuts on a daily basis because they have an enormously beneficial mix of many essential nutrients, which are involved in hundreds of biochemical reactions in the body. Peanuts are a vitamin powerhouse: vitamins B1, B2, B3, B5, B6, B9, and vitamin C at 20% and more of their Daily Value (DV). Peanuts boast a wide range of minerals: manganese (95% DV), magnesium (52% DV) and phosphorus (48% DV). Peanuts also contain about 25g protein per 100g serving, a higher proportion than in many tree nuts. However, it lacks significant amounts of L-methionine, which is responsible for the growth of new blood vessels. Pine seeds are one of the healthiest nuts that every vegan has to include in their diet. A one-ounce serving of pine nuts contains: 4g of protein, 17% of the daily value (DV) for magnesium, 18% of the DV for vitamin E, 12% of the DV for vitamin K, and 9% of the DV for iron. Pine nuts are also a good source of heart-healthy monounsaturated fats. What makes pistachios valuable for vegans is their vitamin B6 content. These nuts are one of the best food sources of vitamin B6. A 100-gram serving of pistachios has 1.7mg of vitamin B6, whereas 100g of salmon have 0.8mg. Pistachios are twice higher in B6 than salmon! Pistachios are a nutritional powerhouse. Of all the popular nut varieties, pistachios have the highest concentration of iron. Relative to other tree nuts, pistachios have a lower amount of fat and calories but higher amounts of potassium, vitamin K, γ-tocopherol, and certain phytochemicals such as carotenoids and phytosterols. Pistachio nuts are the second best source, after almonds, of dietary fiber.